As I've noted before when subjecting a sportsman's musical tastes to scrutiny, it's not often an athlete reveals anything other than a preference for coffee table mediocrity. Still unsure of the identity of this week's pop-picker? Step forward England's own Adrian Grant (right) - a man who would know where the party's at, wherever the PSA Tour lands. Grant is also a fan P-Funk architect George Clinton (pictured above), who Wikipedia notes as "one of the most important innovators of funk music, next to James Brown and Sly Stone." Grant's eclectic range of listening spans hip-hop to house, and even reveals an avant-garde penchant for "lounge-type acoustic bands such as St. Germain from France". As if the marauding Egyptian dominance of the men's tour wasn't enough to worry other squash playing nations, now the women are getting in on the act. The 23 year-old from Cairo defeated top seed Rachael Grinham over 5 games in the semis (only her second win over the Australian - her first being in the same event in 2006), and took the title with a 9/1, 9/4, 9/2 win over England's Jenny Duncalf in the final. The parallel men's final was an all-too predictable affair, with home-spun rivals Amr Shabana and Ramy Ashour again facing one another, in thriller that Ashour took 12/10 in the fifth. "It was so nice to hear the people chanting my name! ... It's such a nice feel to feel that people love you, and they support you, and they take your picture, and ask for autographs ... It's great!" Wouldn't it be nice to hear a player say that after squash tournaments in other countries ?! Next stop for the men is the $200,000 Kuwait Open - there won't be many who'd bet against an Egyptian taking the largest share of one of the biggest prize purses on the PSA tour. 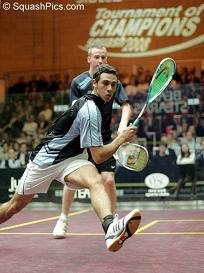 Rumours that Ramy Ashour would skip the British Open after missing last year's event have proved unfounded. "English crowds have always given me a lot of support, and having not played in England since winning the ATCO Super Series Finals last August, I'm really looking forward to playing two back-to-back events". The strongest line-up for the British Open for a number of years includes World number 1 and World Champion Amr Shabana, fellow Egyptian Karim Darwish, the Frenchmen Gregory Gaultier and Thierry Lincou, Aussie David Palmer and England hopes Nick Matthew and James Willstrop. I recently cycled around parts of the Netherlands, and can vouch for all that you've heard about it being a very cool, flat and friendly place. Ok, I've not been there. But when you add those facilities to its 13 glass-backed courts, it's basically as far from my mouldy and municipal London squash shed as you can get. If the general level of facilities in the country are that good it's no wonder Dutch women's squash is in a rude state of health at the moment. And it's just got even better, as a certain Amsterdam resident has decided that playing squash in the Netherlands is worth changing your nationality for. I've written enough on this site recently about the rise of the Egyptians, the great potential in the Indian national squad and strong showings in the junior ranks in other countries. Much of the success of Amsterdam as a training base for many top players appears to be down to the coaching of Liz Irving, former New Zealand international and three-time finalist at the British Open. Irving has coached players such as Vanessa Atkinson (a former World Champion), the current World number 1, Nicol David, and other Dutch players such as Naude and Karen Kronemeyer. 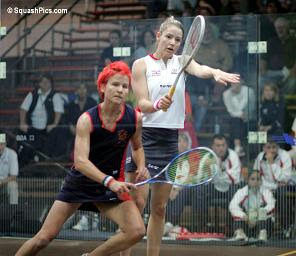 In the 2006 European Women's Team Squash Championships, the Netherlands were comprehensively beaten 3-0 by England in the final (though their top-ranked player Atkinson retired injured against Vicky Botwright), and in the Women's World Team Squash Championships in the same year in Edmonton came 4th after losing to Malaysia. Right: slideshow of the Forexx Dutch Open 2007. The European Team Squash Championships will this year be held in Amsterdam from April 30th – May 3rd, and the women will be hoping that home advantage coupled with a camp strengthened by the addition of Grinham (whom will not be eligible to represent her new country until 2009) will help them wrest the title from the English*. "The choice of Natalie to become Dutch not only gives us a real chance to win a European - and/or World title in the near future with our women's team, but it also means an enormous boost to the juniors and other top players in our country." Grinham's decision to change nationality (speculation of personal reasons why she might have made it aside for moment) is less controversial than it once would have been given that switching allegience from country-to-country by professional athletes is far more commonplace across sport in general. Peter Nicol's move from Scotland to England made the front pages of a few national newspapers. But John White's decision to appear under the Scottish flag made few waves in the media, and I've read nothing that criticises Natalie Granger's globetrotting as either a slight on the country of her birth (England) or where she grew up (South Africa). Neither can it be claimed that Granger's switch from England to South Africa to the US has been detrimental to her own career. She has climbed back up the rankings and, as an ambassador for squash in her role as WISPA President, she appears to do a pretty good job. Of course, media interest (and the pressure that comes with it) is far demanding in squash than for other sports, and some individuals probably find that reconciling your consicence to represent a country other than the one of your birth is a lot easier when the press isn't camped on your doorstep. Kevin Pieterson (cricket), Lesley Vainikolo (rugby) and Stephen Cherono (athletics) have had greater pressures placed on them when mulling over a change of nationality than any squash player. In an increasingly globalised sporting world, old allegiences to your country of birth clearly do not tug as hard as they once did on the heart strings. Where squash is concerned (with its relatively small financial rewards), it is easy to see how a player's ambition to carry on earning a living from the sport they love must sometimes come before patriotism. Grinham is not alone in embracing the orange banner. New team-mate Annelize Naude decided to change her nationality from South African to Dutch a few years ago. One of the reasons that contributed to Grinham's disgruntlement with Squash Australia and the subsequent change of allegience was a growing unease with her Federation's selection policy, after Melissa Martin was not selected for the Commonwealth Games. Many column inches have already discussed the merits of letting the likes of Pieterson, Vainikolo, and Cherono take the place of a homegrown athlete - the debate is one for all sport to discuss. I'm sure the European Teams will be a closely-fought celebration of women's squash in a city that does a great job in facilitating the sport. The Championships are held at the Frans Otten Stadium from 30th April - 3rd May 2008. * At the time of writing, Tanya Bailey had just withdrawn from the Euro Teams due to a knee injury, which further boosts the Netherland's team's chances. It appears that more squash courts are to close in England - this time in Leicestershire. The Chase Squash Club, based at the Chase Hotel and Leisure Club, is a 7-court facility that runs comprehensive coaching programmes and regularly hosts county and regional events. As well as the courts, the club is well-provisioned, with a fitness suite, conference rooms, 10 bedrooms and a restaurant. 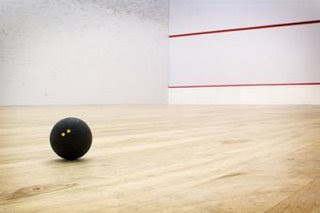 The England Squash website reports that "rumours vary as to what will become of the building, but chances of courts remaining and the club running as before under new ownership are slim." I have reported on squashblog the recent closures of courts in Morley and Harrow, and it is sad to see more squash courts - this time in the Midlands - going the same way. The Chase Club's 200+ members may have to look to move to other clubs nearby, such as Leicester Squash Club and Market Harborough. The England Squash site suggests, however, that member may look to join other clubs over county borders, such as Daventry (Northants), The Park (Nottingham), Coventry & North Warwickshire, Kenilworth, Leamington and Solihull Arden.